Paris, France (February 22, 2017) – Ymagis Group, the European specialist in digital technologies for the cinema industry, today reported its consolidated revenue figures for the fourth quarter of 2016 and 2016 fiscal year ended 31 December 2016. Ymagis Group continues its strong growth trend in 2016 with cumulative revenue up +13% at €178.2M due to acquisitions undertaken in the last 18 months. Revenue for the fourth quarter of 2016 is up +1.6% at €52.3M. As a reminder, following the takeover of Eclair Group’s main activities, Ymagis Group has consolidated the generated revenue in its Content Services business unit since 1 August 2015. Revenue generated by the Group’s services business units in 2016 is up nearly 30% at €108.7M, representing 61% of total Group revenue compared to 53% in 2015. This growth confirms the Group’s strategy to compensate for the anticipated decrease in profits generated by the VPF business unit. The VPF business unit reported a 6.3% decrease in revenue at €17.5M for the fourth quarter. For the 2016 fiscal year, revenue generated by VPF activities is down 5.8% at €69.5M compared to €73.8M in the prior year period. With the end of the financial model in Poland and the Czech Republic, 5,925 screens are under contract compared to 6,127 as of 31 December 2015. Down 10.4% in 2015, the Exhibitor Services business unit reported a 3.0% increase in full year 2016 revenue at €61.2M, driven primarily by the Equipment Sales & Installation businesses, which generated €50.3M in revenue, up +4.1% over the prior year. While the replacement of first-generation digital projection systems has not yet been implemented, Ymagis Group benefited from a favorable business environment with new cinema builds and sustained investments by cinema exhibitors in new image and sound technologies in 2016. This growth was achieved despite a decrease in fourth quarter 2016 revenue for the business unit at €19.5M due to lower revenue generated by the Equipment Sales & Installation businesses over the quarter while business was particularly robust during the same period the prior year. The Customer Service (NOC) Maintenance businesses reported stable fourth quarter 2016 revenue at €2.5M, and €10.3M for the full year. 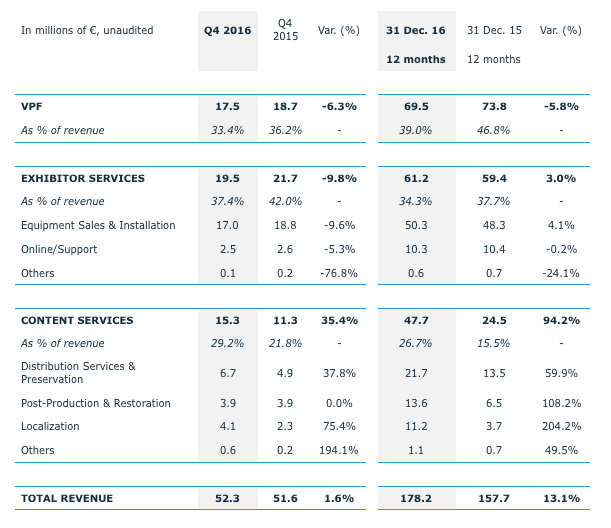 The Content Services business unit continues to report strong growth across its divisions with a +94.2% increase in full year 2016 revenue at €47.5M driven by the Group’s recent strategic acquisitions in France and internationally. For the fourth quarter of 2016, the business unit’s sales revenue is up 36.7% at €15.4M due to external growth and an end-of-year effect in certain divisions. The unit’s Distribution and Preservation divisions recorded a +€8.1M increase with revenue of €21.7M in 2016, and has grown by +€1.8M to €6.7M in the fourth quarter, thanks in large part to the acquisition of Cine-Logistics (Germany) at the start of 2016 and DSAT Cinema in the last quarter. These acquisitions have significantly strengthened the Group’s European presence. Boosted by the integration of Eclair’s businesses, the Post-Production and Restoration divisions also recorded a substantial increase in revenue for the 2016 fiscal year at €13.6M compared to €6.5M for the prior year period. Finally, the Localization division trebled its revenue at €11.2M for 2016, largely due to the consolidation of Eclair’s activities as well as the acquisition of ST’501 (France), CKS (Germany) and Tecnison (Spain). Ymagis Group continues to implement its strategic three-year plan, Perform2020, presented last October and has seen increased growth in its Services businesses despite the anticipated end of its VPF business. In 2016, following the acquisition of Eclair’s main activities, the Group actively concentrated its efforts on its structural reorganization and strategic plan to quickly increase revenue generated by its Content Services business unit. In its position as a growing European leader, Ymagis Group confidently confirms its targeted annual revenue growth rate of at least 10% within its Exhibitor and Content Services business units, for an anticipated profit before taxes of 5% across the entire Group by 2020. Ymagis significantly strengthened its European footprint in 2016 with the signing of key agreements in Italy, Spain, Germany, Turkey and Eastern Europe. With an eye to China, which counts the largest number of cinemas in 2016 ahead of the United States, the Group is in ongoing discussions with China Film Equipment Corporation (CFEC).